NEW Courses! Spring 2019 courses are April 8-12, May 20-24 and June 17-21. courses start on Monday at noon and end Friday evening. Contact us for an Application. The 2018 well count is in. WFA Did 66 wells in Bolivia, 24 in Uganda and 55 in Ethiopia. 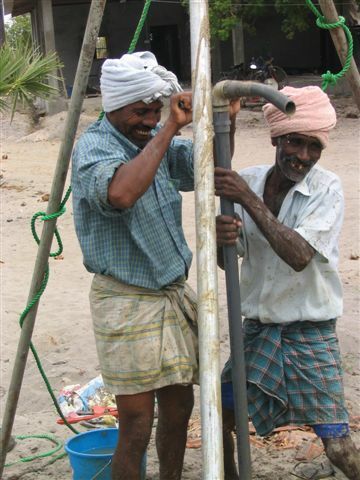 Many of these wells are larger diameter for irrigation. We are drilling in harder areas too through much marum (laterite) rock in Uganda. We are also testing motorized pump jacks we designed in Bolivia and in Ethiopia. Pastor Peter of Kenya and Jim Farmer, with the help of Gary Mitchell who recently took our course with the help of Gary Mitchell for the first one, have drilled 2 new wells in Kenya! Also a great group of young people from church in Austin went and drilled successfully at in a refugee area of Rwanda. Now for super exciting news, Dave Reirson a WFA course alum and founder of Hope2Others said they recently celebrated their 1000th well in Gambia and Senegal. Wow Dave! We only had you down for 500 wells! That means another 500 (approx.) wells we didn’t know about drilled with the WFA method by our programs or by those we trained. If we add 500 of Dave’s wells plus our new 145 wells and Pastor Peter’s wells and the Austin group’s well in Rwanda, that is 647 wells to add to last years rough total of 4,551. That puts the new world wide rough count of low cost family, compound, and small community wells that have been successfully drilled at 5,199 in 29 countries over an incredibly wide range of geologies and conditions. Our manual method is very versatile and user friendly for novice drillers and why we designed it. Most of these wells drilled manually by families and communities themselves! Could you and your group be the next, like Dave, to go start a well drilling movement somewhere where families suffer from not owning a well? Our courses are designed to help serious folks willing to do the hard work go and seriously help others! Pray about it! 2017 well count is in! 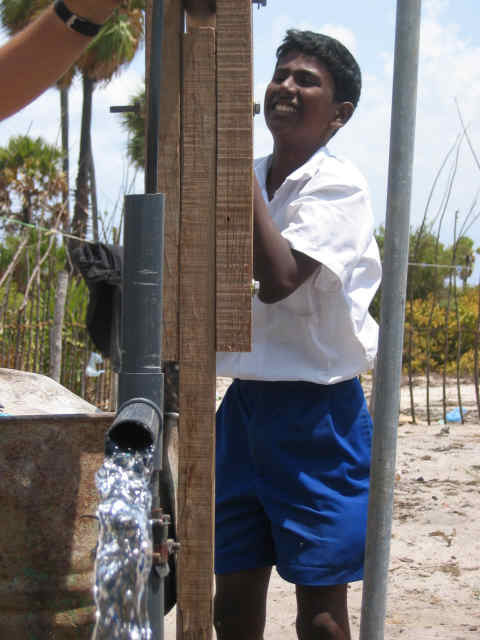 WFA did 118 wells in Bolivia, 80 in Ethiopia, and 50 in Uganda. We were down a bit this year in Africa due to drought and unrest in certain areas but still had a great year! In addition Pedro from Brazil reported to us recently 23 wells don in Mozambique by a group of Brazilian missionaries with local families in Mozambique that we didn't know about. Great job Pedro! Also from amazing Dave from Hope2Others reports around 100 wells in Gambia at least in 2017! So the total wells for 2018 we know about is 271! That bumps to latest world wide count up to 4,551 (approx.) wells drilled so far with or simple WFA, get soaking wet while drilling "Baptist" method. Praise God! 287 wells that we know about were drilled in 2015! These were 100 in Gambia by Dave Rierson of H2Others, and WFA did 68 in Uganda, 62 in Ethiopia, and 52 in Bolivia. Plus 5 in Kenya by Kate. Lots of families and communities helped! 81 wells in Bolivia and 83 wells in Ethiopia in 2014, 108 wells in Uganda in 2014, 42 family wells in Ethiopia in 2012, 10 in Uganda and 70 in Bolivia. Our"well clubs" drilled 182 deep water wells for farm, family, and neighbor use in Bolivia in 2011 and 180 in 2010. All of these families and neighbors have their water problem solved for good! And they know how to make and maintain their own pumps! These are good deep high producing wells (average depth 20-50 meters in Bolvivia making 20 plus liters per minute from confined aquifers). More wells are being drilled now in Bolivia, Ethiopia, Kenya, and and other countries using our "poor friendly" low cost water well drilling method that we designed especially to help the neediest rural families, help themselves. Folks who attended our courses in 2012 drilled in Kenya, Cameroon, Niger, Peru, and Ghana. It can be done and you don't have to be a millionaire to do it! All tools and materials are made in country with local materials. We can show you how! Thanks for praying for and supporting WFA!